The Kalman filter is currently one of the most popular approaches to solving the data assimilation problem. A major line of the application of the Kalman filter to data assimilation is the ensemble approach. 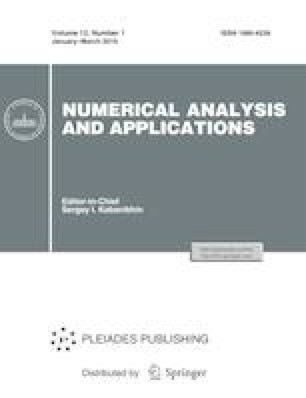 In this paper, a version of the stochastic ensemble Kalman filter is considered. In this algorithm, an ensemble of analysis errors is obtained by transforming an ensemble of forecast errors. The analysis step is made only for a mean value. Thus, the ensemble π-algorithm combines the advantages of stochastic filters and the efficiency and locality of square root filters. A numerical method of implementing the ensemble π-algorithm is proposed, and the validity of this method is proved. This algorithm is used for a test problem in a three-dimensional domain. The results of numerical experiments with model data for estimating the efficiency of the algorithm are presented. A comparative analysis of the behavior of the root-mean-square errors of the ensemble π-algorithm and the Kalman ensemble filter by means of numerical experiments with a one-dimensional Lorentz model is performed. Russian Text © E.G. Klimova, 2019, published in Sibirskii Zhurnal Vychislitel’noi Matematiki, 2019, Vol. 22, No. 1, pp. 27–39.